And then late at night on Canada Day this year , Michelle and I found ourselves making a very last-minute, spontaneous decision to drive out to The Bluffs with our three dogs to watch the fireworks. It wasn’t until the last day of August that I was able to return to Bluffer’s Park with our three dogs, (the day before we moved into our new place), and it was another two weeks before Michelle was also able to join us for a walk through the park. it’s so much nicer in daylight! 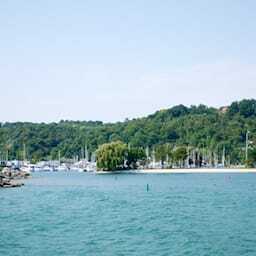 Bluffer’s park really is a gorgeous place – the beach, the many picnic areas, the yachts, Lake ontario, the lakeside restaurant, the view of the bluffs – there’s just so much to take in! I can’t wait until next summer to check more of it out – we’ve only just scratched the surface and have lots more of the park to discover! Bluffer’s Park was published on Saturday, October 13, 2012 at 12:30am EDT by Daniel Menjívar and last updated on April 11, 2018 at 9:30pm UTC .